Introversion has revealed their new game Prison Architect after teasing gaming community for quite some time. We like our dark themes here at Introversion, and this one has been particularly hard to get right. Prisons are an emotive and political issue, and if mishandled a game about prisons would probably be a very uncomfortable experience. We think we’ve got the feel about right. Many people have correctly identified our big influences for this project in Dwarf Fortress and Dungeon Keeper, or just about anything by Bullfrog. We love those games so much, and mixing their mechanics with a topic like prisons has been an incredibly satisfying creative challenge. This opening sequences gives you a good glimpse of what is going to happen in the full game. 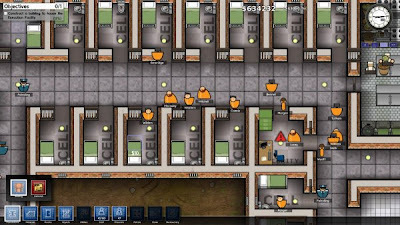 While your tasks are very much based on building, there’s quite a lot of other stuff going on, with prisoners being fed, showered, and let out into the yard for some exercise, and the guards and so forth going about their business. This fully working prison has a bunch of important things to warn you about what will need to be taken care of later in the game, such as a power grid, and security to keep the prisoners in. The presentation is all fairly minimalistic, with 2D, boxy characters milling about, but it does give the impression that there’s a lot going on. A big prison is a complex system to take care of. Crucially, I suppose, Prison Architect does have the feel of the classic “Theme” games, and I can see it eating the same sort of mass of hours that Theme Hospitals and their ilk got through. Little dudes milling about, albeit in grim circumstances. (Just as Theme Hospital’s people were sick but cute.) Because of this peculiarly cartoon cheeriness, however, it does not feel like an Introversion game, if that means anything at all to say that. You can read more about hands on impressions by RPS from here. There is good chance that the game will be available for Linux as all past Introversion games are available for Linux. Few days back, Subversion creator Chris Delay also said to Eurogamer that game will probably be available for Linux. I have also contacted Introversion about a Linux version but still awaiting reply. Update: Introversion has confirmed that Prison Architect will be available for Linux in a recent blog post.